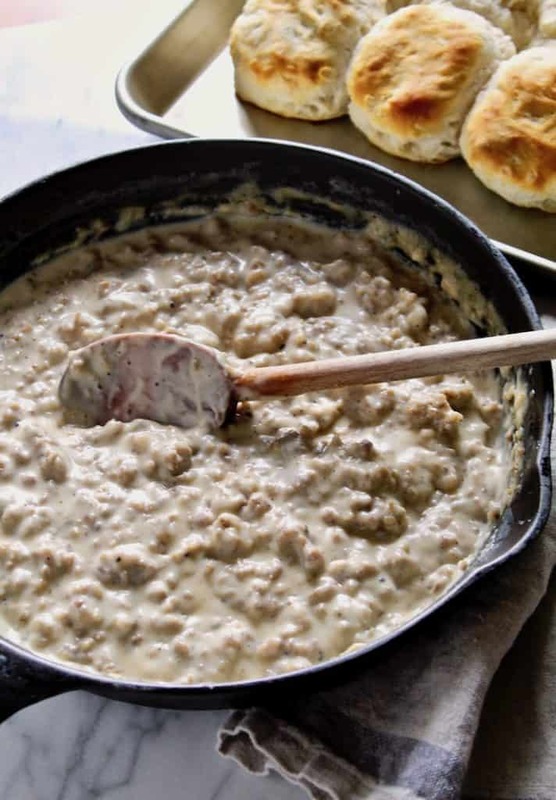 Sausage Gravy and Biscuits ~ Southern-style comfort food for breakfast or brunch. 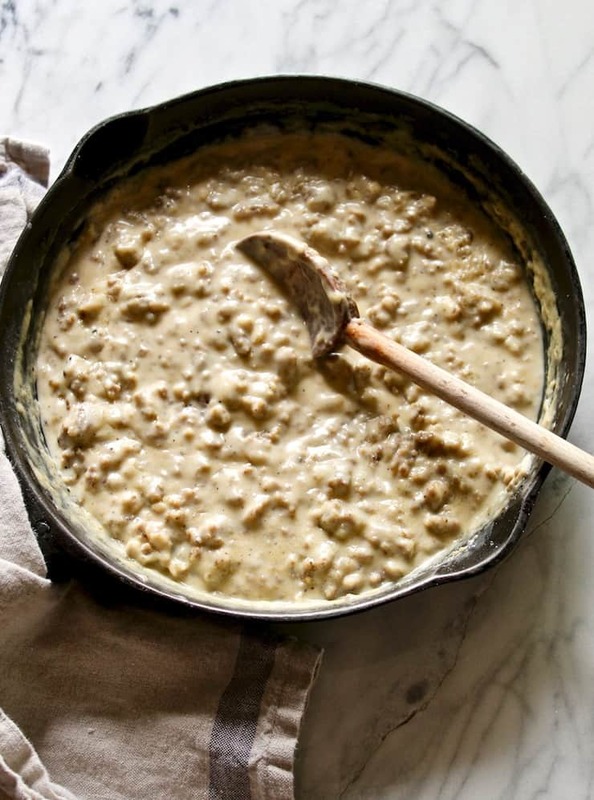 Creamy country-style sausage gravy over warm buttermilk biscuits. I don’t even know where to start with this post. This is the kind of food that is just good old comfort food, plain and simple. It’s homey, hearty, down-home delicious. And it is so easy to make. Here I go with another Ohio story. When we visit my husband’s family, we stay with his brother, Don, and sister-in-law, Paula. She often makes us a big breakfast before we hit the road to go back home. This is where my kids fell in love with biscuits and gravy. Picky Eater ordered it in a restaurant here at home and said it was good but not as good as Aunt Paula’s. My other two girls say the same thing. In Ohio, the sausage to use is Bob Evans. That’s what everybody eats and Paula swears by the stuff. It comes in a pound package, and to brown it, Paula wields some sort of utensil with prongs on it to help break up the meat. Never seen anything like it. So I started making sausage gravy and biscuits for these guys on an occasional Sunday morning or holiday. Well, I don’t make the biscuits, for two reasons. One, I do not like to bake first thing in the morning. And, two, I am not a great baker. There are really good frozen biscuits out there and that’s what I use. They taste great, better than my attempt at homemade. If you make good biscuits, then by all means, make a batch. Go for it. The gravy is pork sausage, flour and milk. And lots of fresh, cracked pepper. That’s it. I wanted to make this for Picky Eater before she headed off to college but it just didn’t happen. So I just made it for Meathead and me and froze the leftovers for her when she comes home soon. The store I was at did not have Bob Evans sausage. So, blasphemy, I used Jimmy Dean. I’m sorry Don and Paula, please forgive me. Use whatever kind of sausage you like, mild or spicy or even turkey sausage. It will be just fine. Also, it is kind of hard to break up the sausage while it’s browning. I take the big hunk of sausage and tear off little pieces into the pan, then turn on the heat and brown it. Much easier this way, I think. When we are all home and I make this, we always have scrambled eggs with it. My husband and I decided on over easy eggs and it was the best. Nothing like a runny yolk and sausage gravy and biscuits. Only thing missing was some hot sauce. We were out of it. Next time I’ll be sure to have some, it just elevates it a notch with a good shake of hot sauce. I make this all the time for the family breakfast on holidays, and usually this sour cream coffee cake, too! 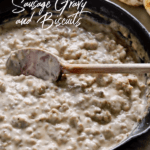 If you’ve tried this Sausage Gravy and Biscuits or any other recipe on the blog, then don’t forget to rate the recipe and let me know how yours turned out in the comments below ~ I love hearing from you! You can also FOLLOW ME on FACEBOOK, TWITTER, INSTAGRAM and PINTEREST to see more of what I’m cooking in my kitchen and recipes. 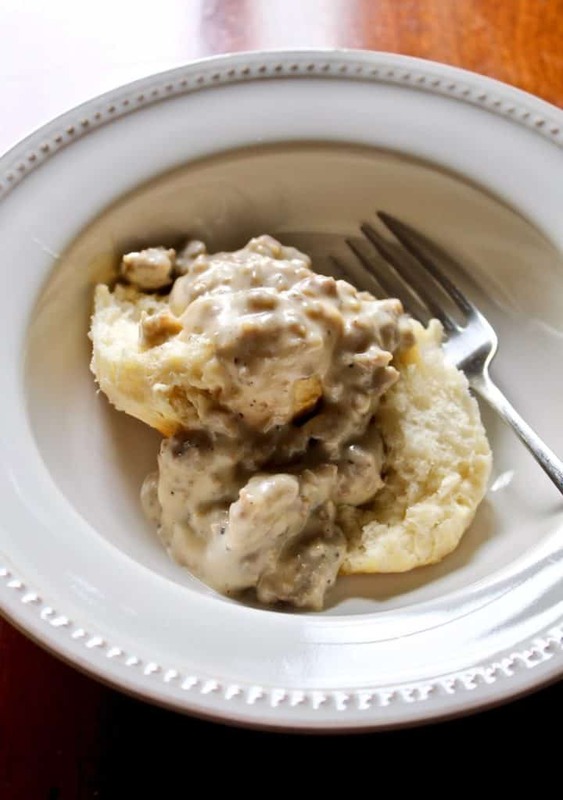 Creamy country-style sausage gravy over warm, split buttermilk biscuits. Prepare biscuits, either homemade or frozen. 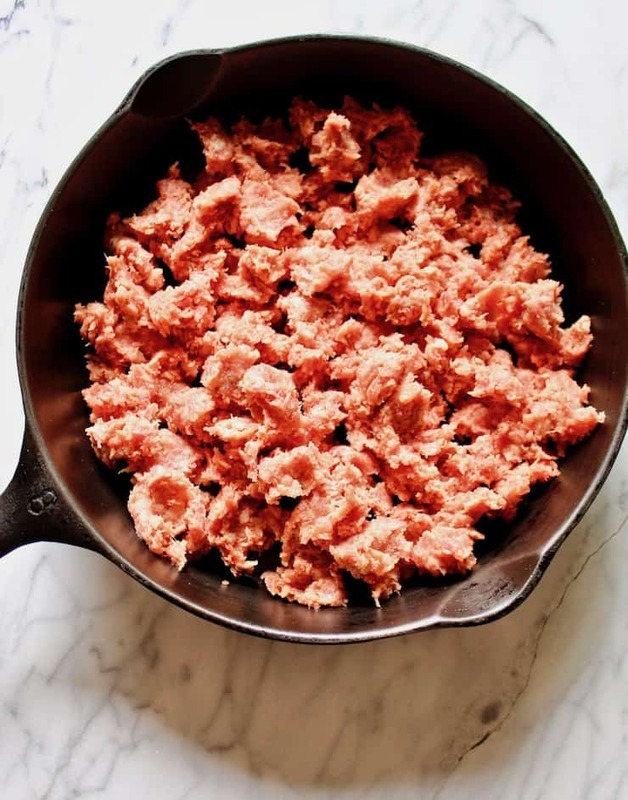 Cut open cylinder package of pork sausage and tear into small pieces and place in a single layer in a large, heavy skillet, preferably cast iron. Turn heat on to medium and let brown before stirring, you want to hear a good sizzle before you start stirring and browning until just done. While sausage browns, make roux: melt butter in small saucepan, stir in flour and mix well, cook and stir for one minute. Do not drain grease. Add the roux to the browned sausage/drippings and mix well and cook another minute or so. Stir in some freshly cracked black pepper. Slowly add the milk and stir the whole time until it starts to thicken. Be sure to scrape up any browned bits and be careful not to burn the gravy while it's thickening. Stir frequently until thick, adding more milk to thin, as necessary. When desired thickness is reached, add a little salt and more freshly cracked black pepper. Taste. Add some more pepper. Split a biscuit and generously spoon the sausage gravy over it. Add an over easy egg or two if desired (highly recommended) and a few shakes of hot sauce. It’s good for the whole family! How long should it take to thicken? Mine will not thicken up! Not very long. I add milk a little at a time and use a flat whisk to incorporate, and it starts thickening right away. It’s definitely thick enough after 5 – 10 minutes. Did you make the roux and not drain the grease? I’m at a loss as to why it didn’t thicken. I just made it Christmas morning, it was perfect! It was AMAZING! Two thumbs up! You are very welcome, glad you liked it. 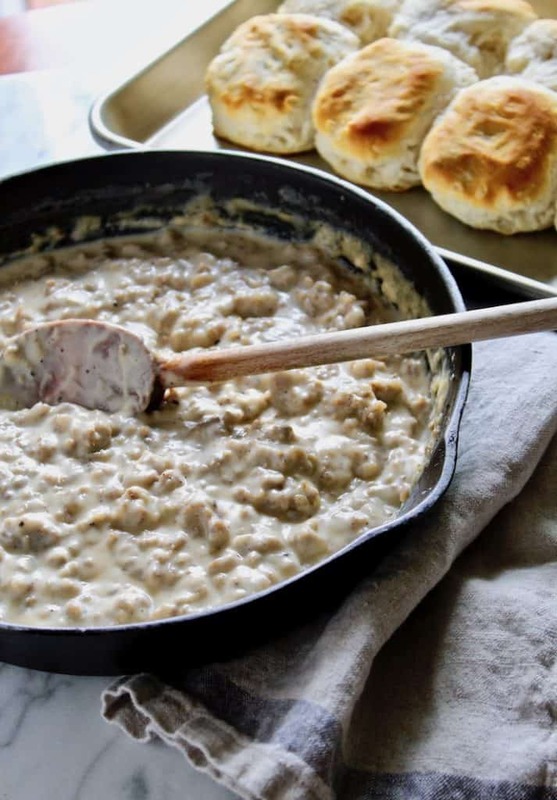 Was my first time making biscuits and gravy and this recipe was very easy to follow!